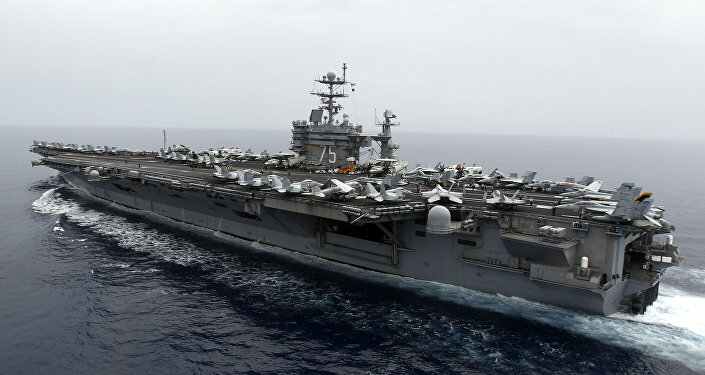 WASHINGTON (Sputnik) – The Harry Truman aircraft carrier strike group (HSTCSG) began air operations this week from the Eastern Mediterranean against the Daesh terrorist group in Syria, the US Navy announced in a press release. "Aircraft from Carrier Air Wing (CVW) 1's strike fighter squadrons conducted sorties over Syria, demonstrating HSTCSG's ability to support two different geographic combatant commanders simultaneously," the release stated. The Truman strike group is attached to the US 6th fleet, which along with the Persian Gulf-based 5th fleet is participating in operations against terrorist targets in Syria and Iraq. The carrier’s air wing operations include three strike fighter squadrons, an electronic attack squadron, an early warning squadron, helicopter maritime strike squadron and other assets, the release explained. In addition to the Truman, the strike group includes four Arleigh Burke-class guided-missile destroyers and a guided missile cruiser, the release noted. After leaving a Norfolk base on April 11, the USS Harry S. Truman carrier strike group entered the Mediterranean Sea on April 19, almost a week after the US, France and Britain launched missile strikes on Syria's military and civil facilities in response to the alleged April 7 chemical weapons attack in the Damascus suburb of Douma. Damascus strongly denied those allegations, adding that the use of chemical weapons in the capital's suburb could have been planned by terrorist groups. Moscow stated the alleged chemical attack on April 7 was a provocation, it warned about in advance. According to the Russian side, the only evidence is a "sloppily staged" video shot by a pseudo-humanitarian organization, the White Helmets, and was intended to "touch hearts." Head of the Russian delegation to OPCW Alexander Shulgin has explained that the Russian military had found two witnesses to the alleged chemical attack, claimed to be victims in the video shared by the White Helmets. The witnesses denied that any attack took place.